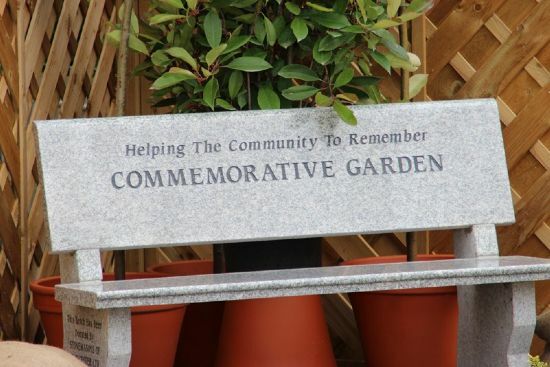 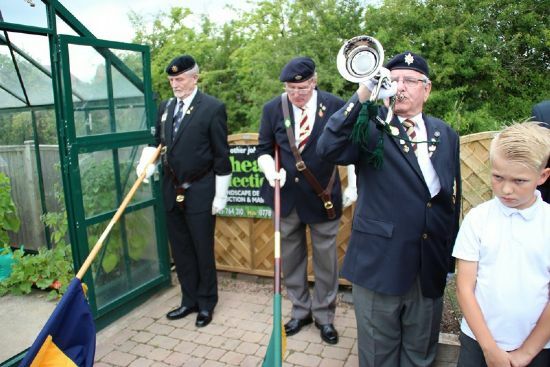 Thursday 17th July 2015 at St Peter`s Garden Centre, Norton, Worcester. 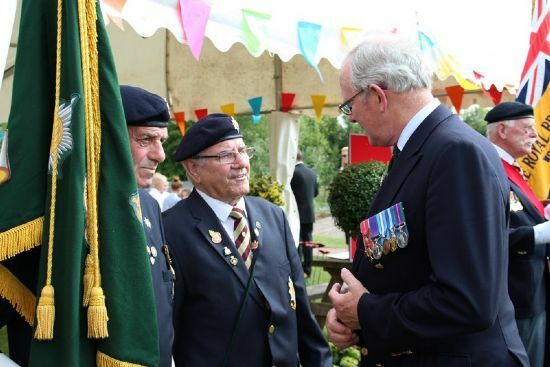 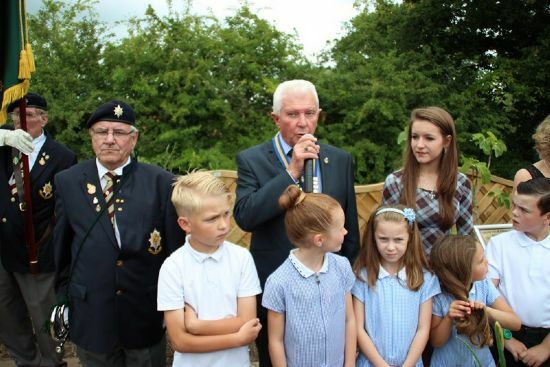 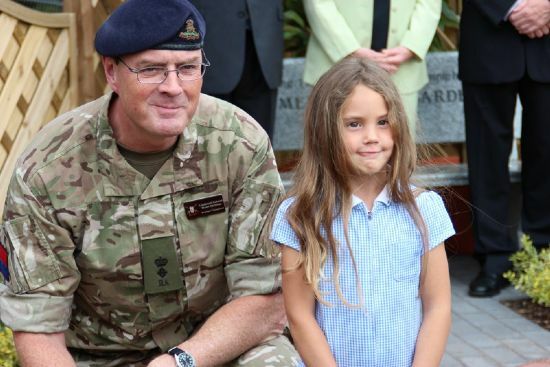 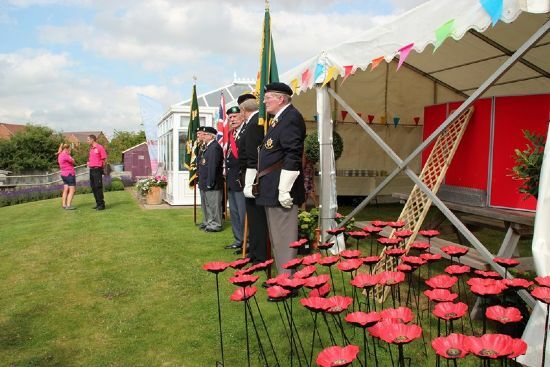 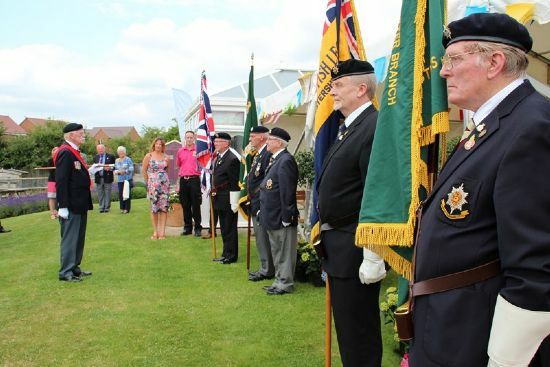 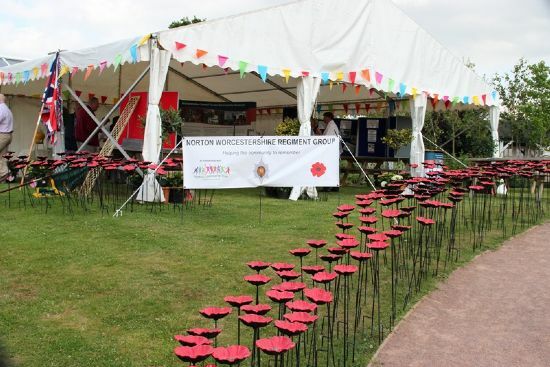 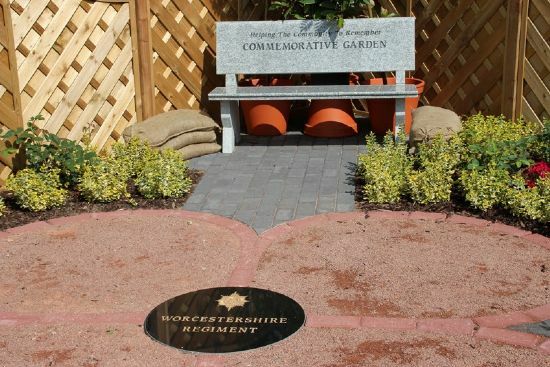 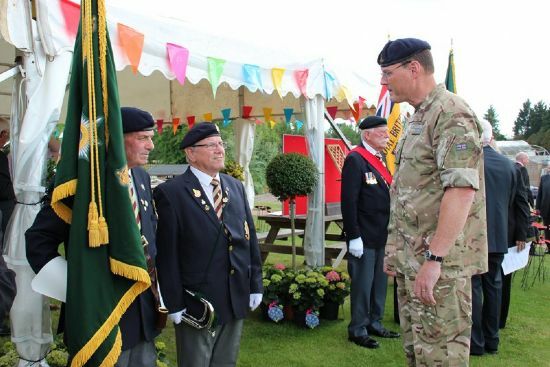 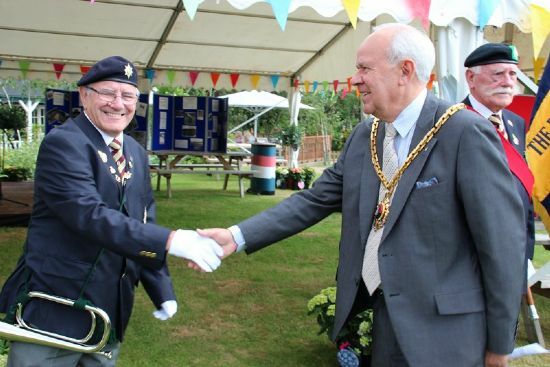 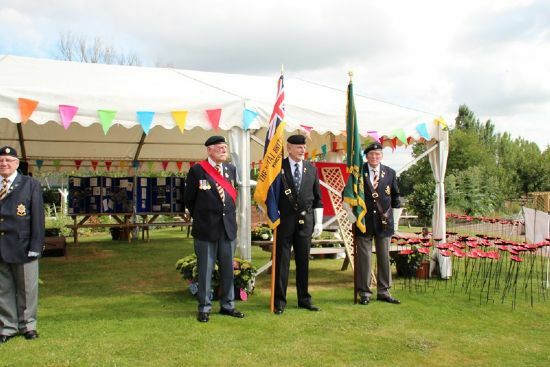 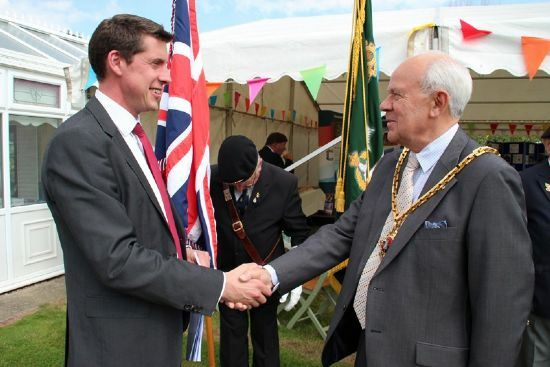 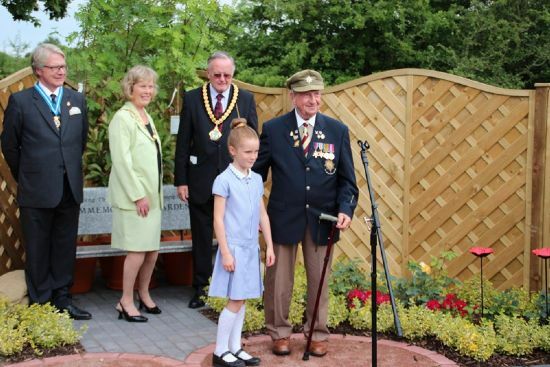 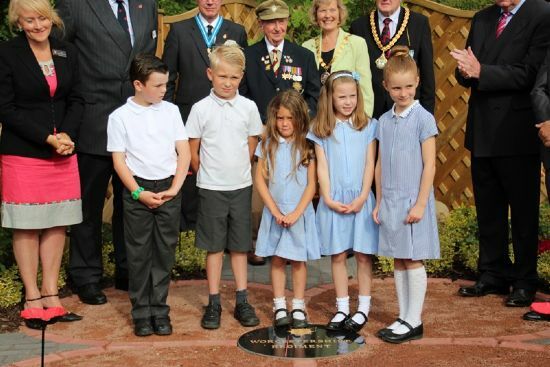 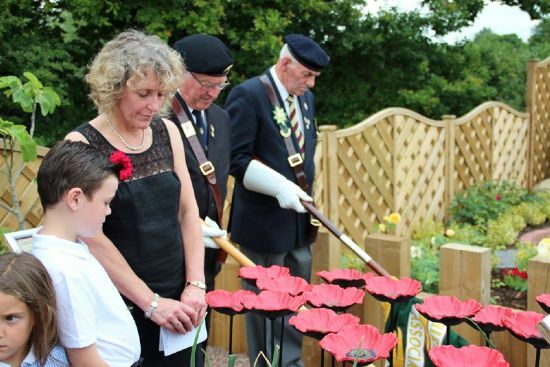 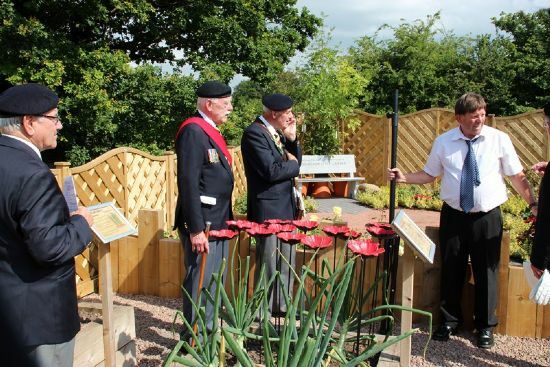 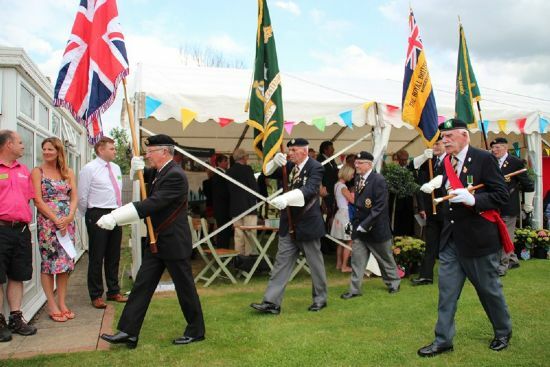 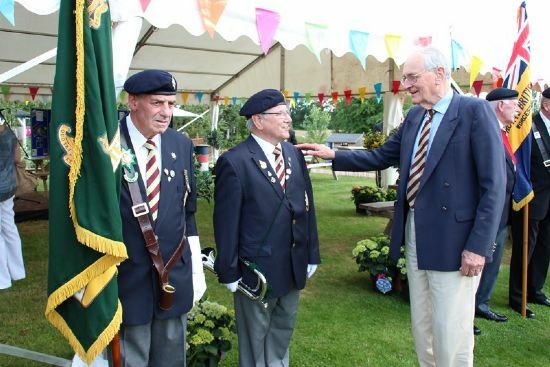 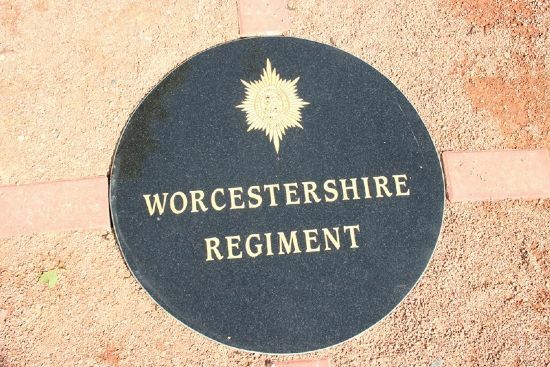 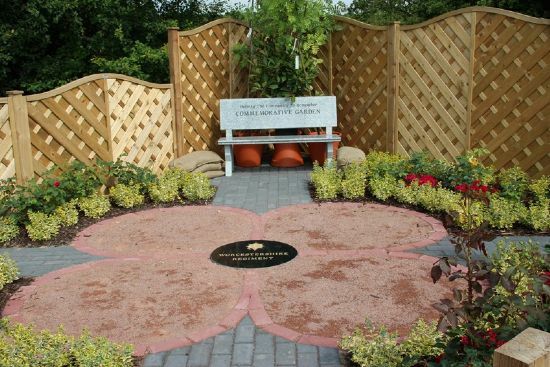 A ceremony and blessing of a commemorative garden to the Worcestershire Regiment and those that served at Norton Barracks was held, a formal opening with a ribbon being cut by the winner of a local school competition to design the garden was performed. 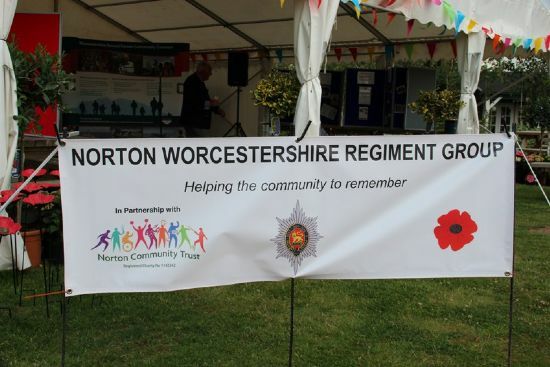 This was organised by the Norton Worcestershire Regiment Group. 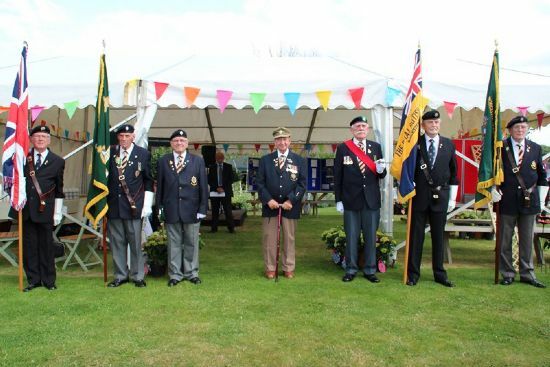 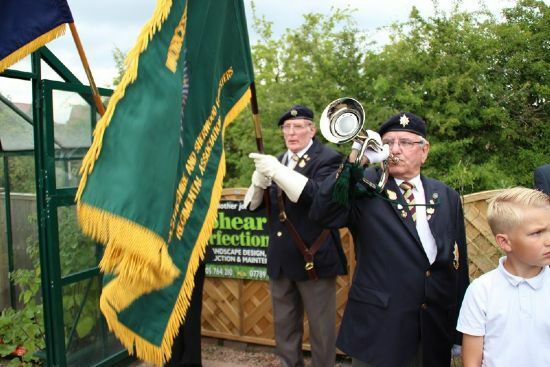 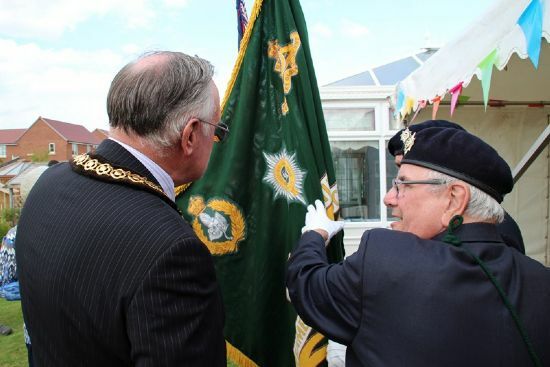 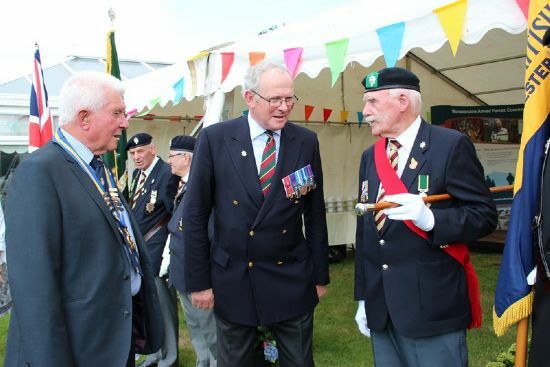 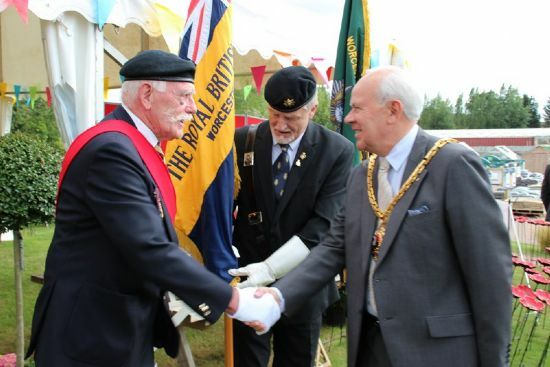 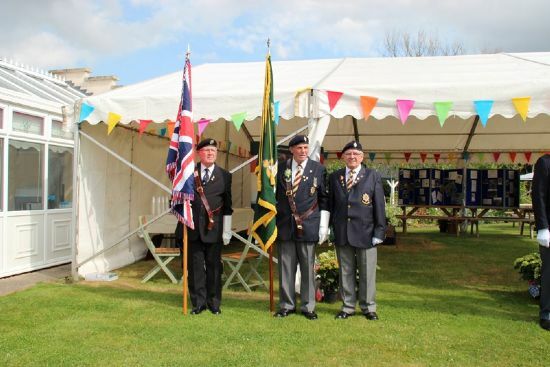 A Bugle and Standards from the Worcester Branch of the Worcestershire and Sherwood Foresters Regimental Association, along with standards from the Royal British legion were on hand for the official duties. 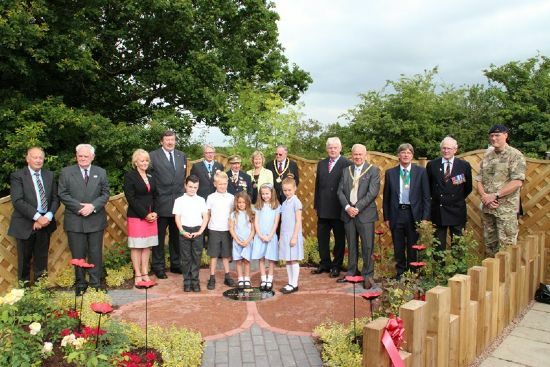 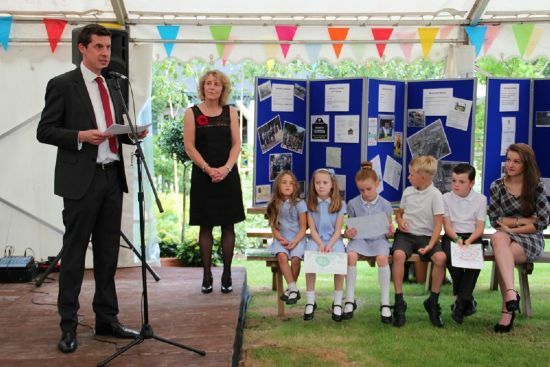 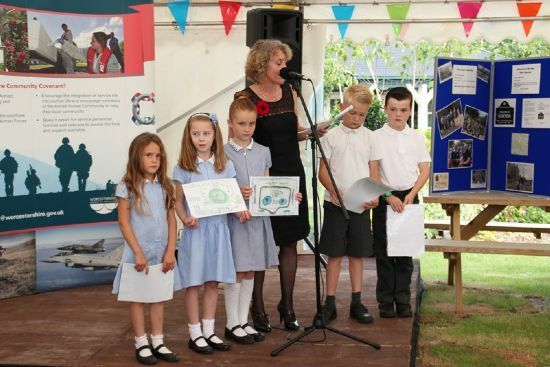 After a welcome speech from Mrs Tracey Hodgkins and explanation of the Norton – Kempsey school children`s competition where Jude Harrison was overall winner of his design of a red tarmac poppy with a centre design of black marble with the badge and inscription of The Worcestershire Regiment with a surround of blue brick sets, a planted garden and a bench for people to rest when they visit. 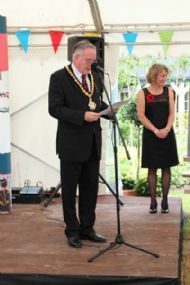 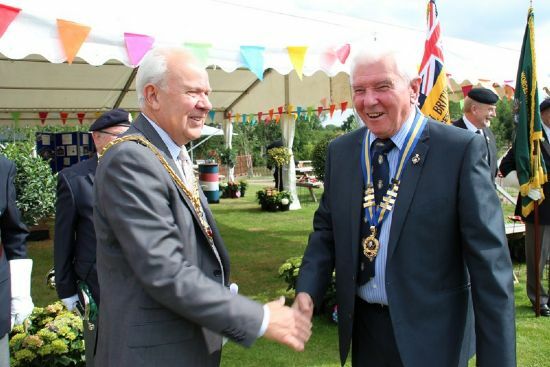 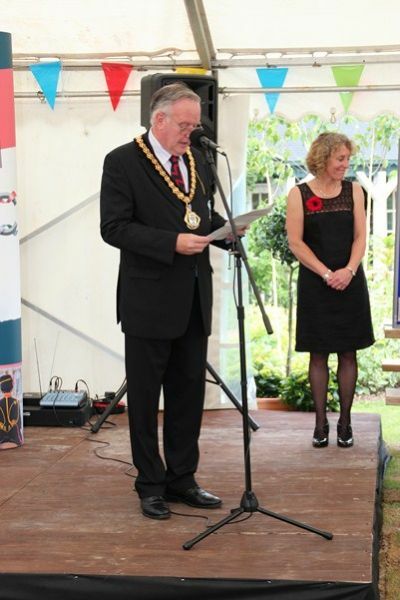 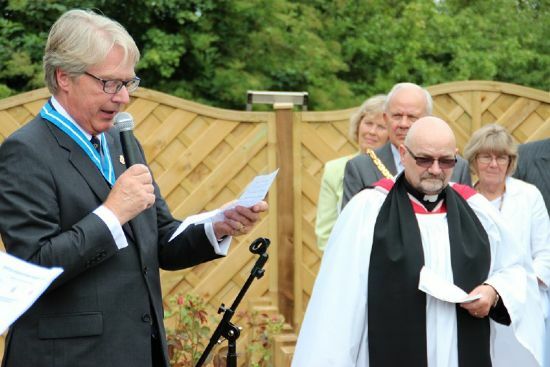 Followed by addresses from Mr Will Blake CEO of St Peter`s Garden Centre and Councillor Ian Hopwood, Chairman Worcestershire County Chairman. 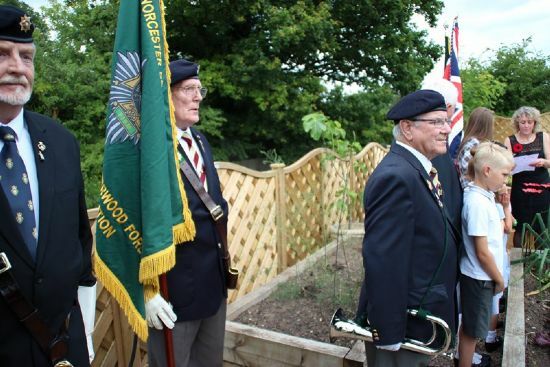 After the welcome speeches the Standards led the way to their places beside the Commemorative Garden along with the Bugler, Dave Waldron RBL County Chairman and Schoolchildren. 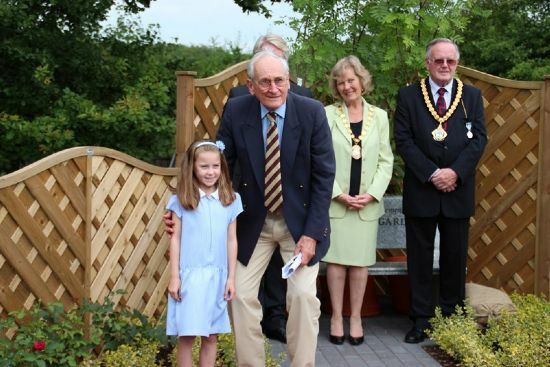 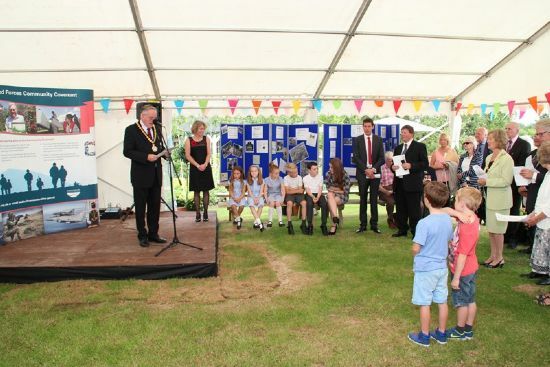 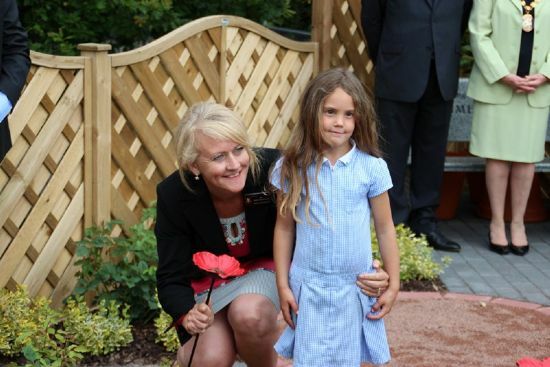 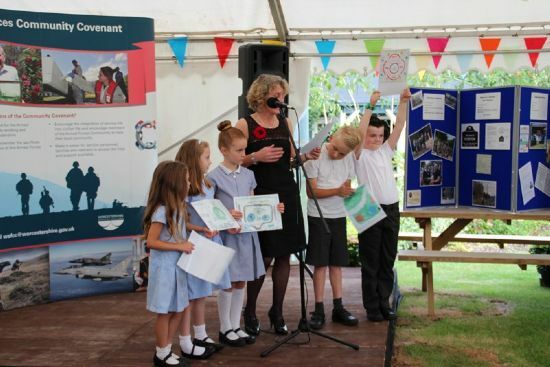 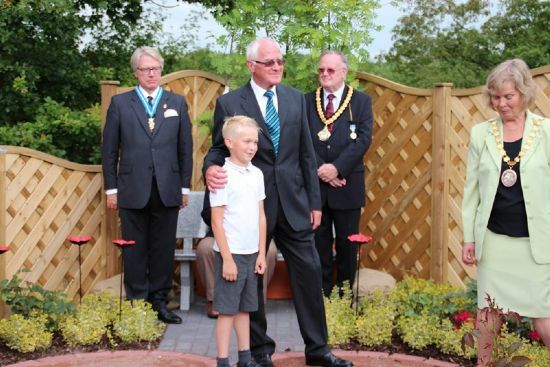 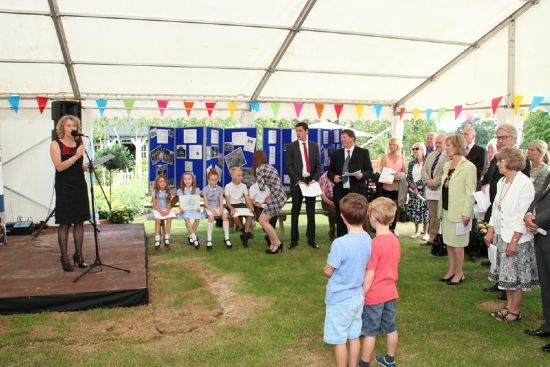 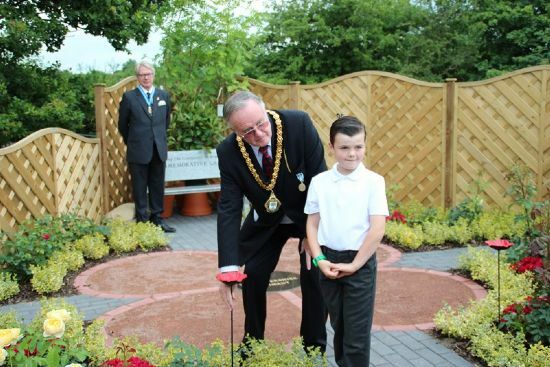 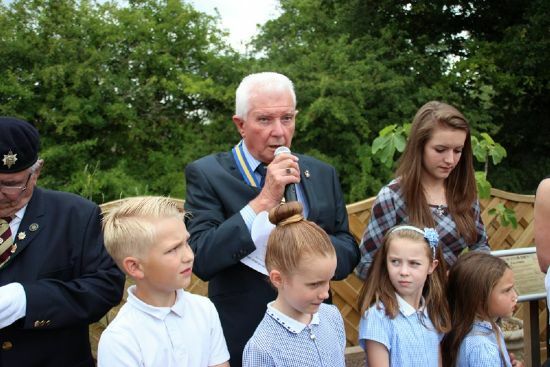 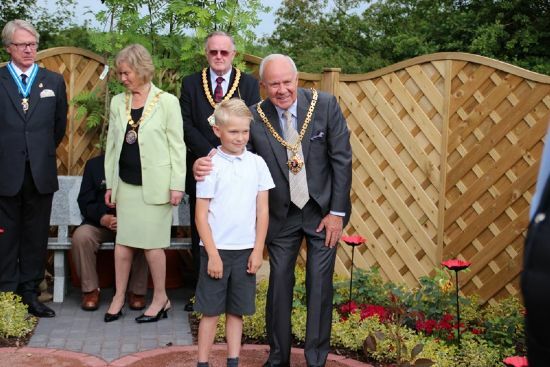 After an Address by Sir Anthony Winnington Bt, High Sheriff of Worcestershire, the overall winner of the school children`s competition Jude Harrison aged 9 cut the ribbon to formally open the garden. 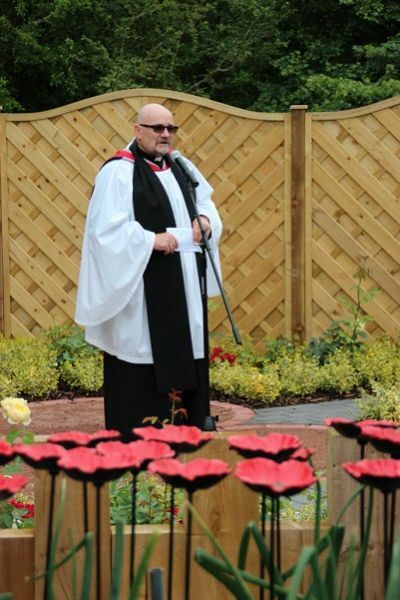 Minister the Reverend Don Slogett led prayers and along with everyone recited the Worcestershire Regimental prayer. 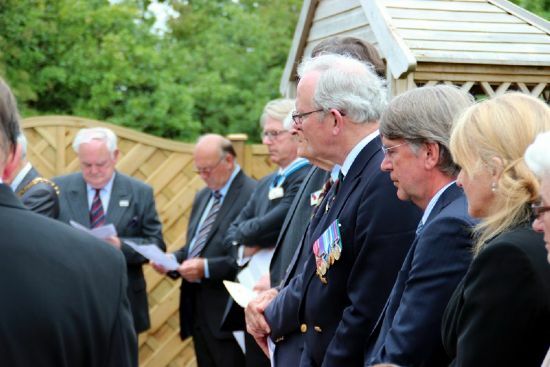 The Exhortation was delivered by Dave Waldron RBL County Chairman, after the last Post, 1 minutes silence and reveille, Dave Waldron delivered the Kohima Epitaph. 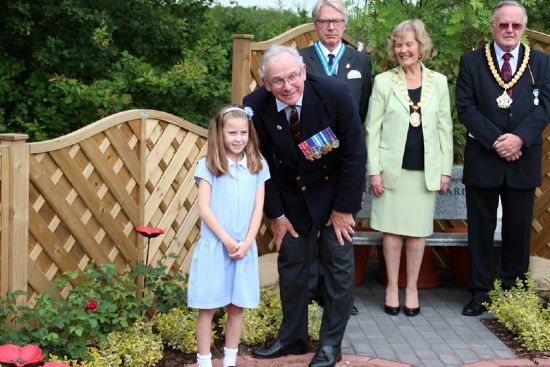 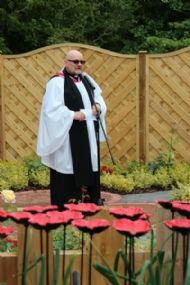 The minister blessed the Garden and this was followed by the laying of tall cast metal poppies by the schoolchildrenalong with dignitaries and honoured guests. 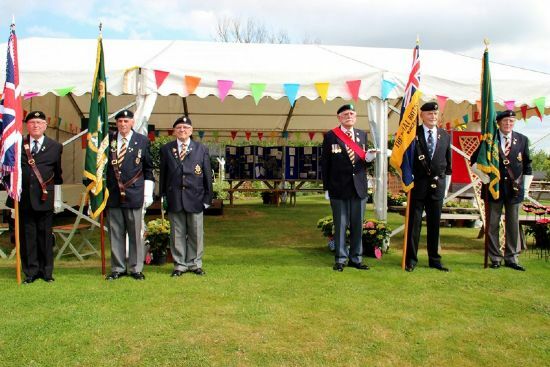 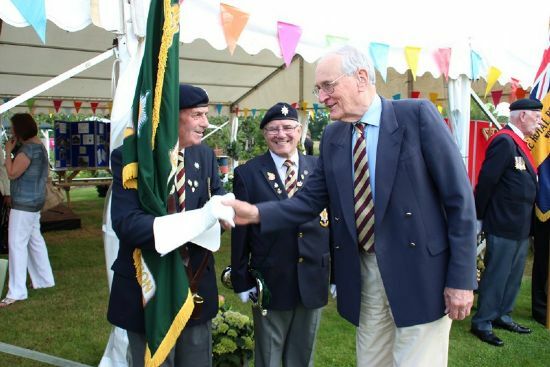 After a photo call the standards were on parade outside the marquee whilst people retired for refreshments. 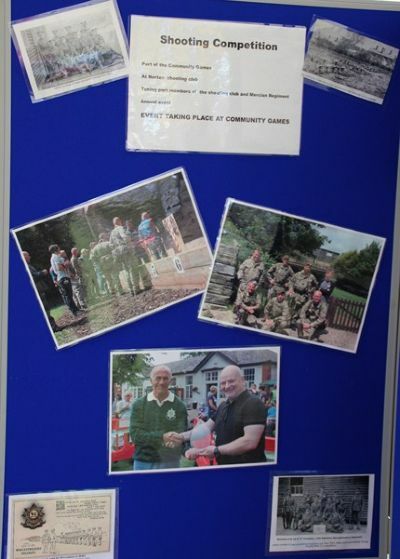 A display was on show including photos from a sports gala day from 21st June this year at the former Norton Barracks. 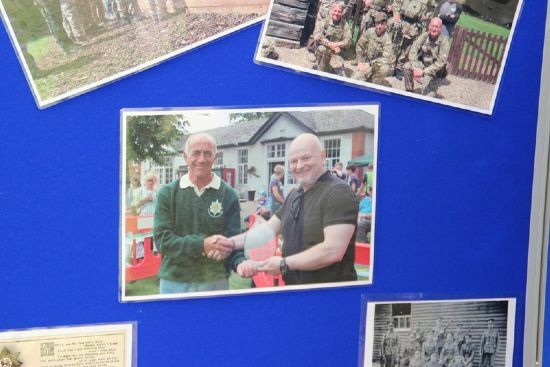 There was a photo of John Walters who had the highest score in the shooting. 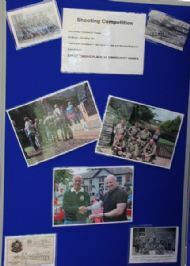 WFRA were the highest scorers. 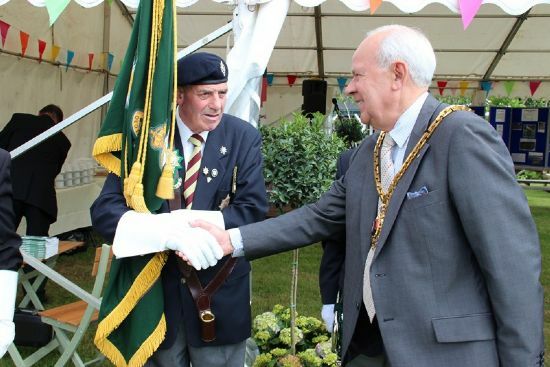 L>, Freda Knight (Mayors Wife) Mayor Worcester Roger Knight, Mark Jackson Col. Retd. 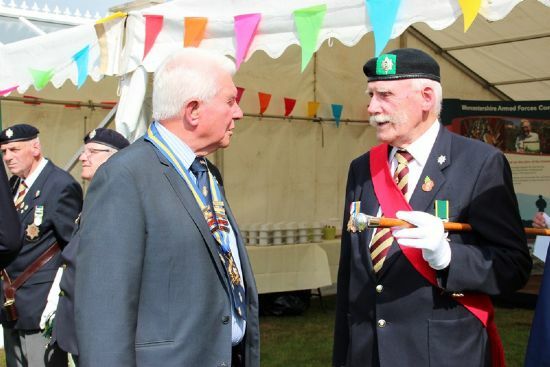 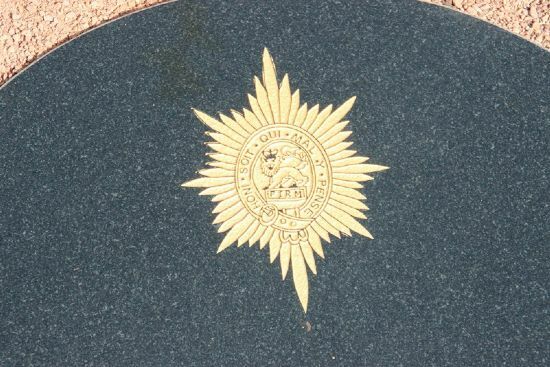 Museum Mercian Worcestershire Trustee. ? 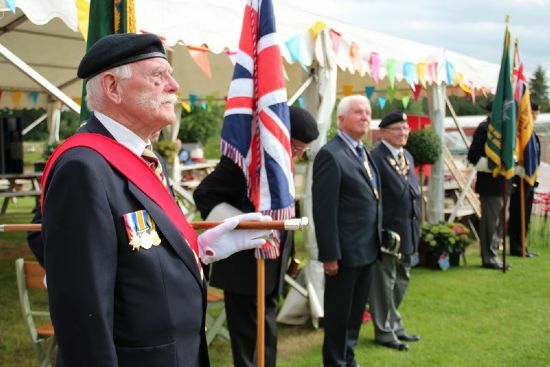 Dave Waldron RBL county Chairman delivers the Exhortation...."They shall grow not old..."
Dave Waldron delivers the Kohima Epitaph " When you go home.."